When a dedication monument or historic marker is needed, Heritage Memorials should be your first and last stop. Heritage Memorials is a full service memorial company serving generations of customers throughout New England with quality memorials at affordable prices for over 30 years. We sell memorials of distinction to people of all faiths and traditions. With a constant commitment to quality and professional service, our goal is to keep earning the trust bestowed upon us by the families we have served and continue to serve. Heritage Memorials prides itself in the quality, service and value it provides to all its customers. Our experienced and qualified staff can help you in the selection of a memorial for you or your loved ones. We have hundreds of monuments in stock on our lot for you to choose from. If you have an idea of your own, we can get the monument in your choice of shape, size and color. Whether it be a time honored hand carved design or a state of the art laser etching, we design and produce unique memorials that tell a story in stone. Each stone is personalized and handcrafted with attention to detail at our shop. It is our goal to help guide you through this memorial selection process. at affordable prices for over 30 years. 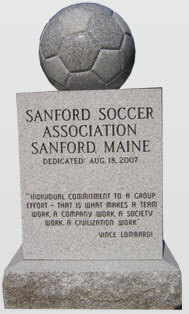 Heritage Memorials of Sanford, Maine, providing cemetery monuments, headstones, gravestones, veteran and civic memorials, signs and pet markers in Maine, New Hampshire and other New England states.